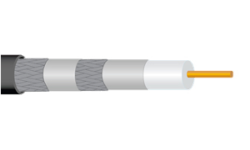 Perfect Flex™ Broadband Coax Cable is backed by the same quality and innovation you’ve come to know and expect from every PPC product. We’ve incorporated our extensive knowledge of the cable industry into a cost-competitive coax cable product line offering superior performance, unmatched quality assurance practices and environmentally-friendly features. PPC does business in an industry that is changing right before our eyes, and we are committed to keeping pace with the needs of our customers around the world. As a multi-national company, PPC products exceed global standards, as our highly-trained lab technicians hold our products to the most rigid standards anywhere. All PPC manufacturing plants globally are ISO 9001:2008 Registered. Most importantly, the PPC Quality Team knows that products need to work in the real world, not just in the confines of a controlled testing site, so our lab technicians subject our products to the most thorough battery of quality checks and simulations available. From prototype to production, our team takes the extra steps necessary to ensure that our products can stand up to environmental exposure, mechanical, electrical and RF testing, and our own unmatched quality requirements. 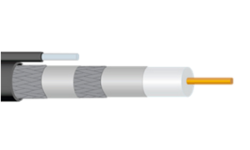 We’ve put that commitment to quality into every inch of Perfect Flex™ Broadband Coaxial Cable. 2. Center Conductor Bond - Proprietary, clean stripping, polymer is utilized to block moisture migration. 3. Dielectric - Unique mix of polyethylene providing mechanically stable, closed cell foam with high VP. 4. First Outer Conductor - Excellent shield isolation before and after flexure is provided by 100% coverage with an aluminum-polymeraluminum tape securely bonded to the dielectric core. 5. Second Outer Conductor - An additional aluminum-polymer-aluminum tape is used in Trishield and Quadshield constructions to further enhance HF shield isolation before and after flexure. 6. Third Outer Conductor - An additional aluminum-polymer-aluminum tape is used in Trishield and Quadshield constructions to further enhance HF shield isolation before and after flexure. 7. Fourth Outer Conductor - An additional 34 or 36 AWG aluminum braid is used in Quadshield constructions to further improve LF shield isolation in extreme RF noise environments. A flowing compound able to seal small jacket ruptures. A patent-pending treatment applied to tape and braid that increases corrosion protection. 9. 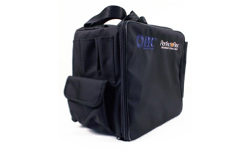 Jacket - A UV stable outer jacket of either polyethylene (PE) or fl ame retardant polyvinyl chloride (PVC) is available to protect the core during installation and for the installed life of the cable. 10. Integral Messenger - A galvanized, carbon steel wire support member attached to the cable by a separable web.